In the Badiyah desert, the Syrian regime’s eastward advance has jammed together America’s covert war in Syria, its overt campaign against the Islamic State, and two camps holding tens of thousands of vulnerable displaced people, all into one shrinking space. A “deconfliction” arrangement to protect U.S.-led Coalition forces in a desert base is all that currently shields the camps from advancing regime and allied forces. But the Coalition isn’t there to protect civilians, it’s there to fight the Islamic State—and around the base, there’s no more Islamic State. The U.S.-led Coalition won’t stay in this base forever, even if it’s unlikely to leave just yet. If America wants to leave, though, it needs to ensure the safety of these camps’ residents first. The Syrian regime’s rapid advance into the country’s desert east this spring scrambled the planning of, and assumptions behind, the international campaign against the self-proclaimed Islamic State. The situation in Syria’s whole east suddenly became substantially more complicated, politically and militarily—but nowhere more so than in Syria’s southeast Badiyah desert. It was in the Badiyah where the regime’s eastward push jammed together a set of U.S. and international lines of effort that had previously—for political and legal reasons, and per a narrative that was partially fiction—been kept studiously, officially separate. The neat categorizations that underpinned American policy in the Badiyah are no longer tenable. In this stretch of desert, parallel covert and overt military projects and two overgrown displaced persons’ camps now have all become interlocking parts of a single nightmare problem. U.S. planners cannot make a decision about any one of these individual elements without accounting for all of them—including the most intractable and seemingly insoluble one, the tens of thousands of displaced civilians stranded in these border camps. Before April of this year, this section of the Badiyah desert had been wide-open wasteland, allowing everyone involved to pretend that these covert and overt military efforts and the Rukban and Hadalat camps were distinct and unrelated. Then the regime and allied, Iranian-backed militias suddenly advanced around this pocket, cutting it off from the Islamic State-held east. In doing so, they put CIA-backed rebel factions fighting both the Islamic State and the regime in a box with forces from the U.S.-led international Coalition against the Islamic State. Coalition forces have a clear mandate to fight the Islamic State, not the Syrian regime. But the “deconfliction” agreement negotiated to protect their base in the Badiyah has only become more tenuous as they have been crowded with these other forces in a single shrinking pocket of territory. The Rukban and Hadalat camps on the Syrian-Jordanian border are tangled up with both of these separate military projects. The camps house nearly 50,000 vulnerable civilians1—maybe more—including the families of both covertly backed rebel factions and Coalition partner forces. Jordan refuses to take in camp residents as refugees, citing security concerns about extremist infiltration. As the regime advances around the edges of this Badiyah pocket, camp residents are protected mainly by the deconfliction perimeter around the Coalition base, near to the Tanf border crossing. RUKBAN CAMP, JUNE 2016. SOURCE: PALMYRA AND SYRIAN BADIYAH CLANS COUNCIL, FACEBOOK. That is not the point of the deconfliction zone, and protecting the Rukban camp is not the Coalition’s mission. The Coalition is in the Badiyah to fight the Islamic State, a mission that, thanks to the regime’s advance, is now mostly void. This Badiyah zone falls outside the various internationally sponsored zones of “de-escalation” in Syria’s west—areas where conflict between the regime and opposition is being frozen to provide space for local humanitarian access and political arrangements. Instead, the camps’ safety seems to hinge almost entirely on the force protection arrangements made for U.S. and allied forces in Tanf. Those arrangements will hold only as long as those forces stay. Which, eventually, they won’t. There are no obvious, palatable solutions for the camps. But without some resolution for these displaced civilians, the United States will be stuck in the desert, unable to either remain safely or leave responsibly. The United States needs an answer for Rukban and Hadalat. The camps are integrally linked to all aspects of U.S. policy in the Badiyah, including the protection of Coalition forces. There are no obvious, palatable solutions for the camps. But without some resolution for these displaced civilians, the United States will be stuck in the desert, unable to either remain safely or leave responsibly. Since last year, Tanf has been the staging ground for a Pentagon “train and equip” effort to stand up an Arab force to combat the Islamic State. This force—supported by Western special forces3 and intended to be independent of Kurdish leadership—was meant to defend the Jordanian border and challenge the Islamic State in Syria’s central Badiyah desert and eastern Deir al-Zour province. The results were underwhelming.4 Meanwhile, to the west of Tanf, two “Free Syrian Army” (FSA) rebel factions backed by the CIA and allied intelligence services waged a hit-and-run campaign against the Islamic State in Syria’s Qalamoun mountains and the Badiyah. Separately, two improvised camps coalesced on the Syrian-Jordanian border between two earth berms marking a no man’s land separating the two countries.5 The camps started to form in 2013 after Jordan closed its Syrian border further to the west, leaving would-be Syrian refugees to trek across barely passable terrain to reach unofficial crossings in the Badiyah. The improvised Rukban and Hadalat camps formed around these crossings. In summer 2014, Jordan also closed the Badiyah crossings, reopening them later to only a trickle of refugees. Between 2015 and summer 2016, the population of the camps grew from several thousand6 to an estimated 70,0007 as residents of Syria’s east fled Islamic State control and the multi-sided military campaign against the jihadist organization. The camps now host displaced people from across the country. Hadalat is smaller than Rukban—the United Nations recently estimated their current populations as 4,000 and 45,000, respectively,14 in line with official Jordanian estimates,15 although humanitarians and rebels assert that those numbers are substantially higher. AID DISTRIBUTION IN RUKBAN CAMP, MAY 2017. SOURCE: FREE TRIBES, EAST RUKBAN SECTOR, FACEBOOK. A spokesman for the Jordanian government did not respond to requests for comment. The Jordanian military declined to comment. In May, an internationally sponsored “de-escalation” agreement mostly froze the fighting in Syria’s west and freed up regime and allied militias for a rapid drive east.24 Syrian and Iranian-backed forces punched through territory captured from the Islamic State by the CIA-backed FSA, shattering what might have been a rebel home base for an offensive on Syria’s east. The regime and its allies then approached the Coalition presence at Tanf. Their repeated probing prompted retaliatory U.S. bombing to protect Coalition forces,25 and it pushed Russia and the United States to use existing deconfliction channels to negotiate a fifty-five-kilometer safe perimeter around the base.26 But while regime and militia incursions into the fifty-five-kilometer circle successfully pinned down the Coalition at Tanf, the regime’s allies traced the circle’s edge down to the Iraqi border. The regime had cut Tanf off from Syria’s east, putting an end to the Coalition’s project of using Tanf to enter Deir al-Zour. The regime and its allies sit just along the fifty-five-kilometer radius to Tanf’s north and east. But that hasn’t been the case to the west, where opposition-held Badiyah extends beyond the fifty-five kilometers and the FSA have fought a running battle against the regime military and an assortment of Syrian and foreign militias. On August 13, UN agencies voiced “deep concern” about the deteriorating security situation around the camps, an area they said was becoming “increasingly unsafe.”33 They also highlighted the scarce food and health care in the camps and the interruption of their supplies from inside Syria. LIONS OF THE EAST PURSUE THE ISLAMIC STATE, APRIL 2017. SOURCE: LIONS OF THE EAST, TWITTER. For now, civilians in Rukban are protected by Tanf. But in the long run, they seem to be protected solely by Tanf, which provides only a tenuous reprieve. And the further concentration of displaced civilians in the deconfliction zone only adds another complicating twist to questions about when and how the Coalition will leave Tanf. The U.S. and Coalition presence in Tanf seems unlikely to last, even if there are currently no plans for a sudden, destabilizing withdrawal. In theory, the Tanf presence ought to be a source of leverage. It sits at the Syrian-Jordanian-Iraqi tri-border area and on a key road link between Syria and Iraq, which is why the regime is apparently so intent on taking it. But it has also become a political headache—without a front against the Islamic State, the Coalition presence there is now of dubious legality and utility, and clashes between U.S. and Iranian-directed militia forces have only barely been contained by the negotiated deconfliction. Any withdrawal from Tanf has to be calibrated in terms of the security of regional allies, what can be gained in a trade for this strategically significant border point, and avoiding a humanitarian disaster for the civilians in Rukban. Any withdrawal from Tanf has to be calibrated in terms of the security of regional allies, what can be gained in a trade for this strategically significant border point, and avoiding a humanitarian disaster for the civilians in Rukban. Washington is unwilling to leave now and be seen as caving to regime and Russian pressure. And Jordanian officials have been very vocal in their insistence that Jordan will not tolerate “sectarian militias”—that is, Iranian proxies—on its Syrian border.42 But none of these concerns seem enough to justify an indefinite, politically fraught Coalition presence in Tanf with no real relation to the Coalition’s mission. “There’s an acknowledgement that we don’t see ourselves having an enduring, long-term military presence at Tanf,” a U.S. official told me. This Badiyah FSA project was basically incompatible with other political and military considerations. Indefinite backing for the Badiyah FSA ran counter to the halting normalization between Syria and Jordan. And covert backing for the Badiyah FSA also threatened the deconfliction zone around Tanf, which was being mixed up in these rebels’ battle against the regime in unintended, problematic ways. The Coalition had already publicly cut loose46 one Pentagon-backed, train-and-equip faction that unilaterally attacked regime forces outside the safe perimeter.47 But even CIA-backed rebels outside the fifty-five-kilometer deconfliction zone were fighting with the Jordanian border protecting one flank and the denied zone protecting the other. All local factions recruited from the camps and several factions fighting the regime continued to maintain some presence inside the fifty-five-kilometer line. It now looks like rebel backers have decided to resolve the contradictions that had been growing more acute as the Badiyah zone shrunk to the edges of the fifty-five-kilometer circle. The end of the Badiyah FSA should, in theory, smooth out political obstacles and shore up the Tanf deconfliction that covers Rukban. If the Badiyah FSA can’t be made to slow down, it is unclear how the United States and the group’s other backers will react. Still, even if the U.S. government’s clashing covert and overt impulses can be fully resolved, that leaves the question of what to do with Hadalat and Rukban’s civilians. There is no land exit for camp residents except through Syrian regime-held or Jordanian territory, but Jordan has refused to let them in. Jordan has the physical capacity to accommodate most of these people—the al-Azraq refugee camp is unfilled, and it could be expanded further49—but is apparently unwilling to allow the large-scale entry of a population it considers an imminent security threat. Rebels I spoke to were all convinced that Jordan’s security concerns meant it would never let large numbers of new refugees in. It seems difficult to parse rumors circulating within the humanitarian community from formal meeting outputs and decision-making. UNHCR and UN OCHA declined to comment for this report. The United States bears a moral responsibility for the civilian communities that exist in the shadow of a Coalition military presence and that have been recruiting grounds for factions backed by the U.S., both overtly and covertly. Especially with the Badiyah FSA being wound down, the Coalition presence in Tanf is now the sole point of failure for the defense of Rukban—there is a direct causal relationship between a U.S. and Coalition deployment and civilian protection. RUKBAN CAMP, JULY 2016. SOURCE: PALMYRA AND SYRIAN BADIYAH CLANS COUNCIL, FACEBOOK. But in addition to ethical concerns, there are practical reasons why the United States needs to devise a solution for the camps. Resolving the issue of the camps is part of stepping down the Coalition’s military involvement in the Badiyah and sensibly reorienting Coalition efforts in Syria towards areas where the Islamic State still exists. And the status of the camps is linked to the demobilization or redeployment of local FSA rebels, whose continued fight against the regime puts Coalition personnel at risk. “The main thing keeping us in the desert are [the camp] residents,” Lions of the East commander Salameh told me before the Badiyah FSA’s foreign intelligence backers urged rebels to pull back to Jordan. Still, Jordan’s sensitivities about extremist infiltration leave the United States with few options for relocating camp residents, at least legal ones. Many of the measures that would seem to save lives are such a policy stretch that they’re back-breaking, and would also violate international humanitarian law—for example, bussing Rukban residents via Jordan to Syria’s southwestern Dara’a province, where a de-escalation agreement has so far substantially reduced violence. “This situation, I’ve just sort of chalked it up to being a total nightmare from a rights perspective,” said Human Rights Watch’s Jordan researcher Adam Coogle. The closest thing to a compromise solution might be a phased, orderly intake of refugees to Jordan, where the Jordanians can take a relatively free hand to conduct security vetting. There exists a national security exception to refugee protections and the principle of “non-refoulement,” or the forced return of refugees or asylum seekers to a country where they may be subject to persecution. If the Jordanians can hew close enough to a plausible individual vetting process—instead of summarily rerouting people on a class basis, including one based on clan—then the United States could provide logistical support for the refugee intake. Asylum applicants who failed vetting could be deported to Dara’a province, where they could at least benefit from the current de-escalation. This is, some allege, roughly what Jordan did when it emptied the same camps in 2014.56 But the population of the camps then was a fraction of what it is now, and the security threat wasn’t so obvious and acute. U.S. pressure and new offers of assistance could help, as they did before, but they may not be enough. For the Jordanians, their refusal to take in Rukban residents may be a red line, not some hardball bargaining position. It may not be possible to totally, conclusively resolve the issue of the camps. One rebel civil affairs official in Rukban told me that the ring of regime control around the camp hasn’t stopped new arrivals—displaced people delivered by smugglers from Islamic State areas.57 Still, the United States bears responsibility as long as it is in Tanf securing these civilian populations, even inadvertently. It should not withdraw from Tanf without some sort of solution for civilian protection, whatever the official parameters of America’s counter-Islamic State mission in the area. Washington also should not consent to a de-escalation agreement covering Rukban that mirrors the deal for Syria’s southwest—that is, an internationally guaranteed agreement to halt the fighting and leave this opposition pocket in place. Whatever deals are now being struck between Damascus and Amman, they cannot produce a viable, credible de-escalation in the Badiyah that Washington should trust and allow. A Russian-brokered and -sponsored evacuation of residents to opposition-held southwest could be productive, although, presumably, the United States could not legally participate. But a U.S.-Russian agreement on a safe zone covering Rukban that excludes Iranian-backed militias58 is not realistic and should not be treated as such. The regime and its Iranian ally are clearly determined to retake the crossing with Iraq. The United States should not trust Russia to guarantee the safety of a vulnerable Badiyah enclave directly in the regime’s path. The de-escalation concluded in southwest Syria is backstopped by local rebels’ military force and by motivated neighbors. No combination of Badiyah rebels, even with continued external backing, can hold the Rukban-Tanf pocket if the Coalition withdraws and takes the fifty-five-kilometer sphere with it. Some camp residents have reportedly returned to areas of regime control already, risking detention and forced conscription.59 If they make that decision freely and with open eyes, it’s theirs to make. But the United States cannot in good conscience allow the regime to retake the entirety of the Badiyah pocket and work its way through the proportion of camp residents who were unwilling or unable to safely return to regime-held Syria. “De-escalation” is the new running theme of U.S. Syria policy, America’s second objective after defeating the Islamic State. But de-escalating Syria’s war does not always entail freezing current lines of conflict, which can sometimes mean locking in zones of control in impossible, unsustainable shapes. In the Badiyah, de-escalation involves closing these camps, but first, somehow, delivering their residents to safety. The United States cannot just address its stakes in the Badiyah à la carte—the camps are linked to everything else, and they need to be addressed to allow the Coalition to write off Tanf. ISIS is finished in the Badiyah. The U.S.-led Coalition’s mission in Tanf, however, cannot and will not be accomplished without a solution for these civilians. “UN Agencies Raise Deep Concern for the Safety and Security of Thousands of Vulnerable Syrians Near Jordan’s North Eastern Border,” United Nations Jordan, August 14, 2017, http://un.org.jo/en/news/un-agencies-raise-deep-concern-for-the-safety-and-security-of-thousands-of-vulnerable-syrians-near-jordan%E2%80%99s-north-eastern-border/183. U.S. official who agreed to speak on condition of anonymity, author’s interview, August 2017. Mitch Prothero and Mike Giglio, “US Special Forces Are Secretly Training Syrian Rebels and Fighting Alongside Them,” Buzzfeed, May 10, 2017, https://www.buzzfeed.com/mitchprothero/us-special-forces-are-secretly-training-syrian-rebels-and. Sam Heller, “Suppose America Gave a Proxy War in Syria and Nobody Came?” The Century Foundation, July 7, 2016, https://tcf.org/content/report/suppose-america-gave-proxy-war-syria-nobody-came/. 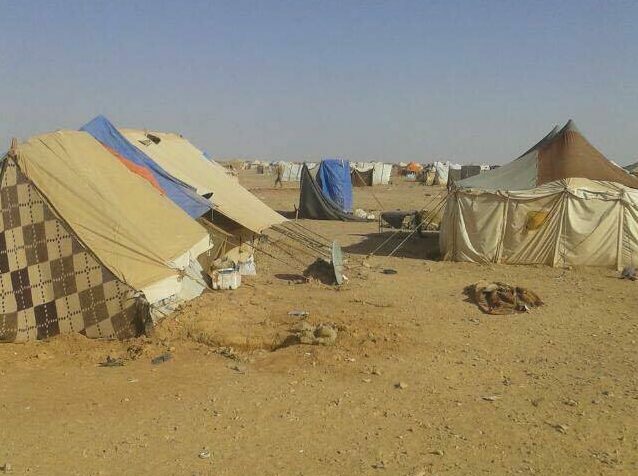 “Jordan: Syrians Blocked, Stranded in Desert,” Human Rights Watch, June 3, 2015, https://www.hrw.org/news/2015/06/03/jordan-syrians-blocked-stranded-desert. “Jordan/United States: Transfer 70,000 Trapped Syrians,” Human Rights Watch, August 5, 2016, https://www.hrw.org/news/2016/08/05/jordan/united-states-transfer-70000-trapped-syrians. Rana F. Sweis, “ISIS Is Said to Claim Responsibility for Attack at Jordan-Syria Border,” New York Times, June 28, 2016, https://www.nytimes.com/2016/06/28/world/middleeast/islamic-state-jordan-suicide-attack.html. “Jordan/United States: Transfer 70,000 Trapped Syrians,” Human Rights Watch. “Muqabilah Hasriyyah ma’ Rais Hayat al-Arkan al-Mushtarakah lil-Quwwat al-Musallahah al-Urduniyyah (Exclusive Interview with Head of Joint Chiefs of Staff for the Jordanian Armed Forces),” YouTube, user “BBC Arabic,” December 30, 2016, https://www.youtube.com/watch?v=I8YSpBn86Ks. Sara Elizabeth Williams, “The ‘buffer zone’ plan for 70,000 stranded Syrian refugees,” IRIN News, October 7, 2016, http://www.irinnews.org/analysis/2016/10/07/%E2%80%9Cbuffer-zone%E2%80%9D-plan-70000-stranded-syrian-refugees. “Obstacles Mount in Fight to Aid Syrians Stranded near Jordan,” Associated Press, July 18, 2017, https://www.voanews.com/a/aid-to-syrian-stranded-near-jordan/3948598.html. Sara Elizabeth Williams, “EXCLUSIVE: World Vision rattles aid groups with solo operation for Syrians at Jordan border,” IRIN News, January 24, 2017, https://www.irinnews.org/investigations/2017/01/24/exclusive-world-vision-rattles-aid-groups-solo-operation-syrians-jordan. “UN Agencies Raise Deep Concern for the Safety and Security of Thousands of Vulnerable Syrians Near Jordan’s North Eastern Border,” United Nations Jordan. “Wazir al-I’lam Yuakkid ann Sunna’ al-Qirar al-Souriyyin Yudrikoun Hikmat al-Mawqif al-Urduni / Al-Momani: ’Alaqatna ma Souriyyah Murashahah li-Manha Ijabi (Minister of Information Stresses that Syrian Decision-makers Appreciate Wisdom of Jordanian Position / Momani: Our Relations with Syria Poised to Take Positive Trajectory),” al-Ghad al-Urduni, August 25, 2017, https://goo.gl/eMbpFQ. Sa’id Seif, media official, Forces of the Martyr Ahmed al-’Abdou, author’s interview, WhatsApp, September 5, 2017. See also “Fasil Souri Yukhli ‘al-Hadalat’ wa-Yasta’idd lil-Insihab Nahou al-Urdun (Syrian Faction Evacuates al-Hadalat and Prepares to Withdraw to Jordan),” Anadolu Agency, al-Sabil, September 5, 2017, https://goo.gl/gNGHVu. Bahira al-Zarier et al., “In displacement camp along Syrian border, ‘the strong devour the weak’ as rule of law fades,” Syria Direct, August 3, 2017, http://syriadirect.org/news/in-displacement-camp-along-syrian-border-%E2%80%98the-strong-devour-the-weak%E2%80%99-as-rule-of-law-fades/. “Obstacles Mount in Fight to Aid Syrians Stranded near Jordan,” Associated Press. Sa’id Seif, media official, Forces of the Martyr Ahmed al-Abdou, author’s interview, WhatsApp, August 2017. Khetam Malkawi, Omar Akour, “Jordan commander: IS expands hold in border camp for Syrians,” Associate Press, February 15, 2017, https://apnews.com/6f19357cea4c4dc49631d4958373fc23/jordan-commander-expands-hold-border-camp-syrians. Muhammad Adnan, Free Tribes Army spokesman, author’s interview, Skype, August 2017. Sarah El Deeb, “Syrian Troops Shift Focus to IS-held East,” Associated Press, May 9, 2017, https://www.apnews.com/a11b32c73b974f99b37ba1acd7f94b3b/Syrian-troops-shift-focus-to-IS-held-east. “U.S. aircraft conduct strike on Syrian army convoy,” CBS News, May 18, 2017, https://www.cbsnews.com/news/us-aircraft-strike-syrian-regime-forces-al-tanf-base/. “Department of Defense Press Briefing by General Harrigian via Teleconference,” U.S. Department of Defense, May 24, 2017, https://www.defense.gov/News/Transcripts/Transcript-View/Article/1193060/department-of-defense-press-briefing-by-general-harrigian-via-teleconference/. “Al-Nizam al-Souri Yubsit Seitartuh ala Kamil Badiyat al-Suweida (Syrian Regime Seizes Entire Suweida Badiyah),” al-Dorar, August 10, 2017, http://aldorars.com/news/1027. “Daghat ’ala Fasail al-Badiyah al-Souriyyah li-Iqaf Qital al-Assad (Pressure on Syrian Badiyah Factions to Halt Fight Against Assad),” Enab Baladi, August 31, 2017, https://www.enabbaladi.net/archives/170522; humanitarian sources, author’s interviews, August 2017. “Wazir al-I’lam Yuakkid ann Sunna’ al-Qirar al-Souriyyin Yudrikoun Hikmat al-Mawqif al-Urduni / Momani: ’Alaqatna ma Souriyyah Murashahah li-Manha Ijabi,” al-Ghad al-Urduni. Noura Hourani and Madeline Edwards, “Already Displaced Syrians Flee as Airstrikes Reach Within 100 Meters of Remote Camp,” Syria Direct, August 15, 2017, http://syriadirect.org/news/already-displaced-syrians-flee-as-airstrikes-reach-within-100-meters-of-remote-camp/. Humanitarian source, author’s interview, August 2017. Tlass Salameh, commander, Army of the Lions of the East, author’s interview, WhatsApp, August 2017. Humanitarian sources, author’s interview, August 2017. The Army of the Lions of the East (@osoudalshrqia), Twitter, August 30, 2017, https://twitter.com/osoudalshrqia/status/903040177295196162. WhatsApp group chat, confirmed in chat by Sa’id Seif, media official, Forces of the Martyr Ahmed al-Abdou, September 3, 2017. Seif, author’s interview, September 6, 2017. Tlass al-Salameh, commander, Army of the Lions of the East, author’s interview, WhatsApp, September 5, 2017; Younes al-Salameh, spokesman, Army of the Lions of the East, author’s interview, WhatsApp, September 8, 2017. “Majlis al-Wuzara Yuqarrir Tasdid 100 Milyoun Dinar min Madyouniyyat al-Baladiyyat / Al-Momani: Musammimoun ’ala Infaz al-’Adalah bi-Hadithat al-Sifarah al-Israeliyyah (Cabinet Resolves to Settle 100 Million Dinars of Municipalities’ Debt / Momani: Determined to See Justice Is Done in Israeli Embassy Event),” al-Ghad al-Urduni, 14 August 2017, https://goo.gl/8G7Y6F. Western diplomat and local rebels, author’s interviews, August 2017. Alternate means of keeping Iranian-backed units away from Jordan’s border seem not to have worked. On September 1, 2017, a Syrian pilot held by the Badiyah FSA was released as part of a conditional prisoner exchange deal. Among the deal’s stipulations—as announced by those Badiyah factions, at least—was that “sectarian militias” would remain 40 kilometers from the berm marking the Jordanian border. As of September 5, 2017, Ahmed al-Abdou’s Seif said that the regime and its allies had not complied with the deal. It’s unclear if they had ever agreed to it to begin with. See “Rasmiyyan… ‘Usoud al-Sharqiyyah’ wa-‘Quwwat al-Shahid Ahmed al-Abdou’ Yakshifun ’an Bunoud Safqat al-Tayyar (Officially: Lions of the East and the Forces of the Martyr Ahmed al-Abdou Reveal Terms of Pilot Deal),” al-Dorar, September 1, 2017, http://www.aldorars.com/news/1380; “Mubadirah Jadidah fil-Badiyah al-Souriyyah wal-Qalamoun al-Sharqi Yadkhul Dimn Khafd al-Tas’id (New Initiative in the Syrian Badiyah, East Qalamoun Enters De-escalation),” Al-Dorar, September 5, 2017, http://aldorars.com/news/1438. Ryan Browne, “US tells local Syrian allies they must only fight ISIS and not Assad, prompting exit of allied group,” CNN, July 27, 2017, http://edition.cnn.com/2017/07/26/politics/us-syrian-allies-isis-assad/index.html. al-Dorar al-Shamiyyah’ Truth [of Reports] They Were Stripped of Their Weapons by the Coalition),” al-Dorar, August 2, 2017, http://aldorars.com/week_issues/8. “UNHCR Jordan – Azraq Camp Fact Sheet – April 2017,” UNHCR, April 5, 2017, http://data.unhcr.org/syrianrefugees/download.php?id=13402. Humanitarian sources, author’s interviews, August 2017. Salameh, author’s interview, WhatsApp, September 2017. Adam Coogle, Human Rights Watch, author’s interview, WhatsApp, August 2017. Al-Baraa Faris, civil affairs officer, Army of Revolutionary Commandos, author’s interview, WhatsApp, August 28, 2017. “Mubadirah Jadidah fil-Badiyah al-Souriyyah wal-Qalamoun al-Sharqi Yadkhul Dimn Khafd al-Tas’id,” al-Dorar. Bahira al-Zarier and Madeline Edwards, “Hundreds of Displaced Syrians Risk a Return Home as Regime Forces Approach Rukban Camp,” Syria Direct, August 29, 2017, http://syriadirect.org/news/hundreds-of-displaced-syrians-risk-a-return-home-as-regime-forces-approach-rukban-camp/.